What I like about this place is their light and crispy baguettes. While the filling is a bit thin compared to some, but it is generally better proportioned than most places. 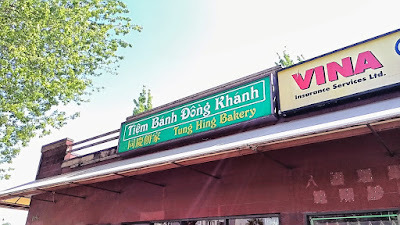 The baguettes from Tung Hing Bakery 同慶餅家 have always been crispy and light. 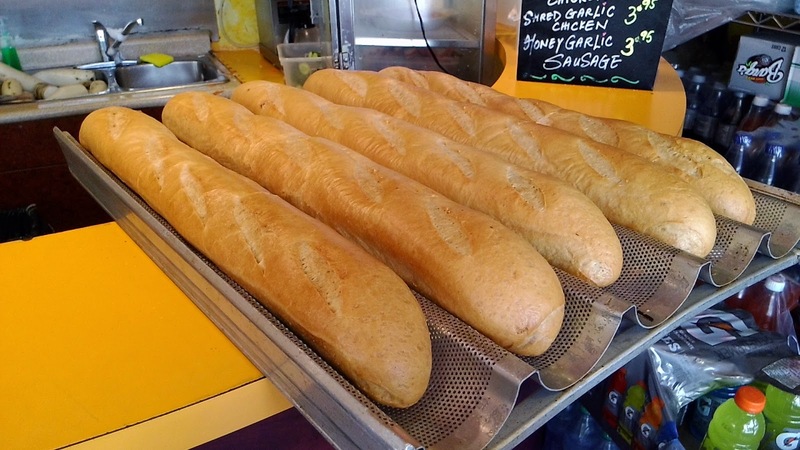 However, today, the baguettes, while still very light, lacked the usual crispness. The baguettes were more of a dry weak crumble. 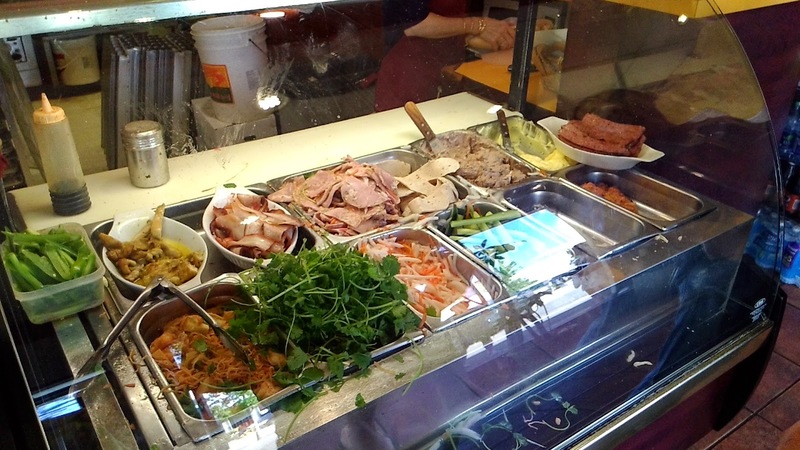 The usual dac-biet sandwich consisted of the two different types of cold cuts, pork belly, pate, pickled daikon/carrots, cucumber and cilantro. We opted to have jalepeno also. Even with today's weaker bun, this House Special Banh Mi still had better bread density and bun-to-filling ratio than its competitors. 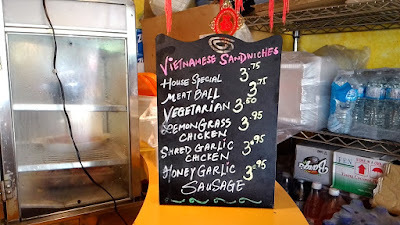 While I like the house special sub, I mainly came here for my usual order of Garlic Sausage Banh Mi. 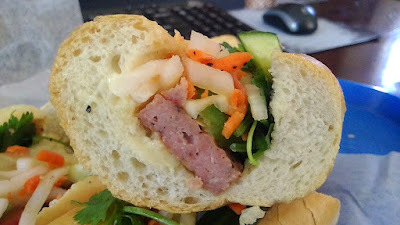 I haven't been able to find this sandwich at other banh-mi shops. If anyone has any recommendations, please do share. Other than the common vegetable sidekicks, the proteins in this sandwich consisted of thick butter and a strip of firm sweetened sausage with a strong garlicky and peppery taste. Mmm,,,that light and crisp bread, that firm garlicky sausage and that fatty butter...that's why I'm here! 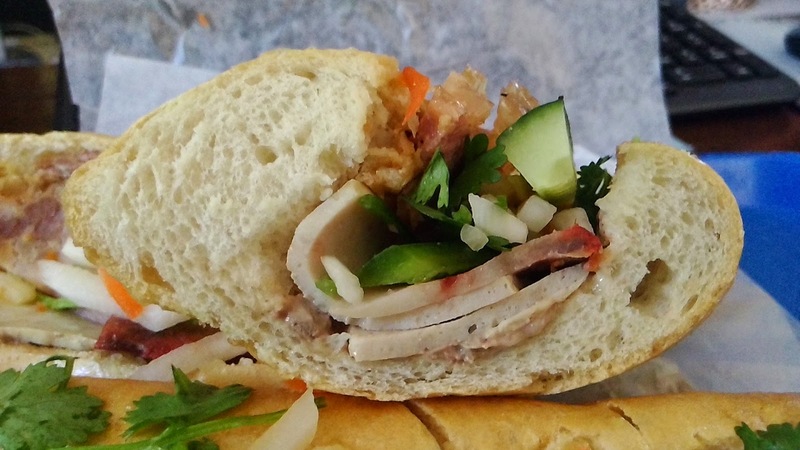 Some banh mi shops may have better tasting fillings, but the dense and overly dry buns have also ruin the whole package. The sandwiches at Tung Hing Bakery 同慶餅家, while not spectacular, have a better balanced and harmonized ratio.